This year, for the fourth year in a row, students from the University of Leeds had the opportunity to delve into the M&S Company Archive and find out about decades of M&S history, all whilst working towards their degree. As well as merchandise from the last 130 years, the Archive holds company records, annual reports and employee magazines - making it a rich resource for academic research. Using archive items to map CSR development within M&S, the module is one of the University’s ‘Discovery’ modules aimed at offering students extra opportunities to broaden their learning and pursue personal interests, whilst helping them to develop skills they will need once they graduate. Students were split into groups and given the task of researching CSR practices within M&S, from a certain decade. They then had to present their findings. 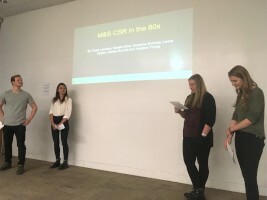 The best group from each decade was awarded the 2016 CSR research prize and was chosen to present their findings to business representatives including an M&S Archivist and a member of the regional management team. Katherine Chorley, M&S Archivist, said "the students were really confident in presenting which showed they really understood what they were talking about’’. The module has been a huge success, with nearly 300 students signing on this year. Students found it a great opportunity to gain a unique insight into one of Britain’s most highly recognised brands. One student said "we were able to put a face to a name, we see the brand everyday so it was great to learn more about it’’. Another student when asked how she felt about being able to use the Archive within a University module said ‘’I think we’re really lucky’’. Corporate Social Responsibility is one of several modules that use the M&S Company Archive as a hands-on resource and is a fantastic example of how the collection can enhance learning and teaching. With relevance to subject areas ranging from business and geography to linguistics and design, the archive can be used to support students and academics from a vast array of disciplines. Contact the Archive team to explore how the M&S Company Archive could support your research or teaching.